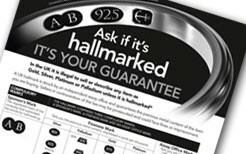 One of the requirements of the Hallmarking Act 1973 is that all dealers supplying precious metal jewellery shall display a notice explaining the approved hallmarks. This must be the notice produced by the British Hallmarking Council, as shown below. Dealers Notices are available from the Assay Office Birmingham at a cost of £10.00 each including VAT and postage at the prevailing rate. The British Hallmarking Council and UK Assay Offices have received an increasing number of consumer and trade enquiries concerning the legitimacy of various descriptions being used at point of sale to describe gold plated sterling silver items. Higher gold prices have driven an increased demand for gold plated silver items. Many of these products are being described in a misleading way with no reference to silver or the fact that they are plated. These descriptions also often make a specific reference to gold fineness, leading the consumer to believe they are buying gold when they are only buying silver. The UK Hallmarking Act 1973 Schedule 1 Part 1, paragraph 1(1) (a) makes provision for the description of gold plated articles. The Act sets out to protect the use of the words “gold”, “silver”, “platinum” and “palladium”. If an article is not gold Schedule 1 Part 1 paragraph 1(1) (a) of the Act permits the use of the word “gold”, provided it is followed by the word ‘plated’. Examples of misleading descriptions we have encountered include: 22ct Gold clad ring, 22ct gold vermeil ring. In both cases the rings were silver with thin gold plating. In both cases a gold description is applied with no reference to plating or the silver. The British Hallmarking Council is therefore issuing this Guidance document to cover the permitted descriptions for gold plated silver articles. When the word ‘gold’ or a specific gold fineness description is used to describe a gold plated silver article; the article must be described as silver and the word ‘gold’ must be directly followed by the word ‘plated’ in the description e.g. 18ct gold plated silver ring. Other terms like vermeil, may be used in addition but the phrase ‘gold plated’ and the word silver must appear within the description e.g. 18ct gold plated vermeil silver ring. The term ‘Silver gilt’ may be used to describe gold plated silver, providing a specific gold fineness is not applied as part of the description e.g. silver gilt ring. The gold plated layer must be of fineness of at least 375 parts per thousand and should not exceed 2 microns in thickness. Gold plated silver articles will be hallmarked as Gold plated silver articles are not covered by the ‘mixed metal’ amendment to the Hallmarking Act (2007). Other than the silver hallmark or a 925 stamp on underweight items, no other standalone gold fineness marks are permitted on gold plated silver articles, because they are potentially confusing and misleading to the UK. It is not permitted additionally to mark the article 9K, 10K, 14K, 18K etc, nor can the article be marked 375, 416, 585, 750 etc. For the same reasons, ‘American’ style mixed marks are not permitted either, for example 925 1/20 14K. This is the same as it has always been for gold plated and rolled gold articles under the Hallmarking Act 1973 in the UK. A gold fineness mark (not hallmark) is allowed if it is immediately preceded or followed by the words ‘gold plated’. For example an article with a silver hallmark (or 925 stamp on underweight articles) can be marked as follows ‘925 & 18ct gold plated’. This guidance applies to all gold plated silver articles below the 7.78 gram exemption weight for hallmarking, as well as for those requiring hallmarking. The ‘exemption’ is an exemption from hallmarking itself, not from the requirements of every other part of the Hallmarking Act 1973. Theses enquiries were considered by the British Hallmarking Council. The precious metal content of articles (i.e. the fineness of the precious metal) can vary and is identified in a hallmark by reference to a numerical range (“millesimal” finenesses). For example, the fineness of gold articles ranges from 375/9ct to 999/24ct . Fineness can alternatively be identified in a hallmark by using an approved term, such as “Sterling”. The fineness of the article determines the value of that article, which in turn determines the price. In Council’s opinion therefore descriptions used by retailers and others in the course of a business that do not include reference to a specific fineness standard, are incomplete and potentially misleading. It has therefore issued this new Guidance Note for all those in the supply chain. Schedule 1 of The ­Hallmarking Act 1973 (the Act) makes specific provision for the use of the words “gold”, “silver”, “platinum” and “palladium” but does not stipulate that the precious metal description must –identify the fineness. When the word ‘gold’, ‘silver’, ‘platinum’ or ‘palladium’ is used in the description of a precious metal article, it should always be accompanied with a specific millesimal fineness or an approved fineness description as provided by the Act and listed in the table above. This guidance also applies to all gold, silver, platinum and palladium articles including lightweight items that are under the exemption weight and do not need to be hallmarked. In this situation consumers have no means of knowing the precious-metal fineness standard if it is not included accurately in the description. The ‘exemption’ is an exemption from the requirement to be hallmarked, not from the requirements of every other part of the Hallmarking Act 1973 nor from consumer protection legislation.